What are the odds that a person who does not normally listen to a musical hybrid of Black/Brutal Death Metal would appreciate such a production to a great extent? Usually, they are pretty low, but the latest release from BLISS OF FLESH has certainly caused a shift in my opinions, and one towards a positive direction too! Hailing from France, BLISS OF FLESH are known for fusing Metal’s extremities - namely those of Black Metal and Brutal Death Metal - and concocting a hybrid of extreme music that is both grim and melodic. The band members are comprised of vocalist Necurat, guitarists Sikkardinal and Pandemic, bassist J. Poizon and drummer Fleshstigma. Composed as the final installment in a trilogy of albums (the previous two being “Emaciated Deity” and “Beati Pauperes Spiritu”) based on Dante’s The Divine Comedy, “Empyrean” is a dark yet epic journey that takes one through hell and back. “Ascension” starts off with a slow tempo that soon speeds up with the introduction of bass hooks. The double bass drumming and the melodious riffs are in-your-face and the use of clean singing complements the guttural vocals very well, where the former manages to give the song a rather melancholic edge. The second track, “Penitent” features shrieks/growls, Death Metal riffs and skull-crushing drum beats. The note-worthy use of a choir with its haunting voices serves as a stark contrast to Necurat’s guttural vocals. The rich Black Metal vibe of “Agnus Dei” is enhanced through the extensive use of double bass drumming. Repeated chants in Latin are also included in the background, infusing the track with a gothic feel. “Empyrean – Last Kingdom” might start off slow, but it soon transforms into a mind-blowing track. Hard heavy riffs and bass lines are abundant in this tune as Necurat’s growls and shrieks tear through the air. The tempo slows down at the end, but it turns out that this is all just a beginning for the following track “Empyrean – Miserere Mei”. The track’s opening continues where the previous song left off, building anticipation with the down tempo drumming and riffs. Soon, double bass drum beats and riffs kick in together with the growls. Similar to “Agnus Dei”, chants in Latin can be heard amidst the chaos of the track, bringing an odd sense of tranquility to an otherwise tumultuous tune. “Empyrean” closes off with “Renunciation”, featuring some delicate plucking of strings combined with the wind effects, plus a surprising inclusion of a violin passage, all of which help create a desolate ambience. Necurat’s vocals sound rather tender at the start of this track, but all prior tenderness is lost once the song crescendos and Necurat’s scream kicks in. The song is interspersed with riffs, pulsating drumming and harsh singing, all of which soon gives way to a particularly melodic guitar solo. In conclusion, “Empyrean” is bold and ambitious. The use of Death Metal growls, Black Metal shrieks and clean vocals make a unique and pleasant combination. The occasional symphonic elements such as the aforementioned violin passage and choirs also give the album an orchestral vibe. Overall, the way these elements are composed and arranged fit the dark theme of the album really well. 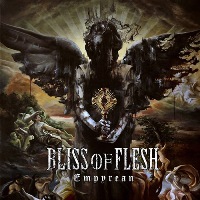 BLISS OF FLESH has definitely earned itself a new fan!